People from all walks of life — including politicians, government officials, traditional and church leaders, representatives of the private sector and others- have paid tribute to the late former Congressman Faleomavaega Eni Hunkin. They attended the Prayer Service to remember and celebrate the life of a man remembered as a statesman, a hardworking leader, and who fought so that the people of American Samoa would get the same benefits as others across the United States. The nearly three-hour service at Gov. Rex Lee Auditorium included six main speakers and four others whose lives were impacted in a positive way by Faleomavaega who passed away Feb. 22 at his home in Provo, Utah - which is also where his final services will be held Mar. 10 and 11. And while American Samoa was always Faleomavaega’s priority during his 26-years in Congress, he also reached out to assist, defend, and help the millions of people in the Asia and Pacific region, during his long tenure on the U.S. House Foreign Affairs Committee’s Subcommittee on Asia and the Pacific. “He will be missed not only by our community but by the Asia Pacific region and people around the world,” according to words printed on the program for the Prayer Service. In attendance were Lt. Gov. 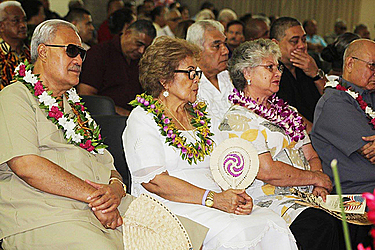 Lemanu Peleti Mauga, who is also the acting governor, Chief Justice J. Michael Kruse, and Secretary of Samoan Affairs Mauga Tasi Ausega and his wife Lagi. Also present was former Congressman Fofo I.F. Sunia and Pulu Ae Ae Jr., representing Congresswoman Aumua Amata, who plans to attend Faleomavaega’s final service in Provo. Faleomavaega and Kruse had worked in Washington D.C. at the Office of A.U. Fuimaono, who was American Samoa’s first elected Delegate to the U.S House. Faleomavaega “leaves a legacy of love and service as an example to the next generation of stewards, with a challenge and hope for a better tomorrow for our people, and the next generation of leaders entrusted to protect and build prosperity for the future of American Samoa,” the family says. Among the main speakers, and the first to address the audience, was Adney Reid, president of the L.D.S. Pago Pago West Stake. 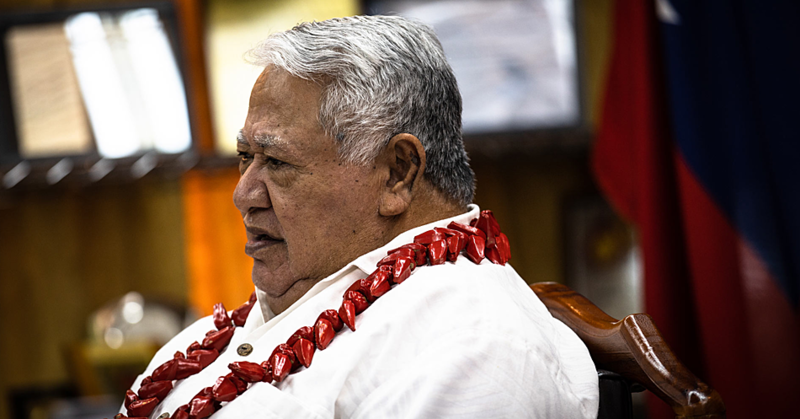 He said Faleomavaega “was a great man” who touched the lives of so many people who saw Faleomavaega as a Congressman, golf buddy, and a dear friend, and to others, he is someone that would sit down to play the ukulele and sing. And although his “Uncle Eni” has passed on, “his legacy will live on forever. And in order for that legacy to live on — brothers and sisters — you have to remember, you have to tell his story. As a native son, Faleomavaega returned home to serve the government and people at a young age — after getting an education, serving in the U.S. Army, and working in Washington D.C., Lemanu provided background of Faleomavaega’s work upon returning home, and the first of those jobs, was deputy attorney general and followed thereafter at still a young age, Faleomavaega became the lieutenant governor — and it was during this tenure that Faleomavaega was the first Samoan to sail from Tahiti to Hawai’i on the Polynesian Voyaging Canoe, “Hokule’a”. “Faleomavaega loved his Samoan people,” Lemanu said, who noted that the late Congressman not only served in the U.S. Armed Forces — deployed to the Vietnam War — he was also instrumental in assisting on setting up the U.S. Army Reserve Unit in the territory. 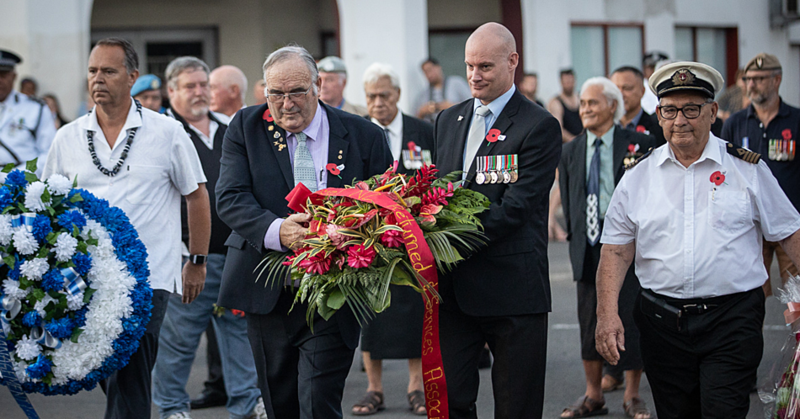 Lemanu, a military retiree, recalled during his time in the military when Faleomavaega would make stops at his post as well as other military posts where Samoans were stationed. Faleomavaega, who was also an Army Reservist, attended military retirement ceremonies of Samoan soldiers, such as Iuniasolua Savusa (former local Homeland Security Department director) and Motusa Tuileama Nua (current Health director). Because of his strong support of the military, Lemanu recalled one time, a few years ago, when Faleomavaega traveled on a flight here to accompany the remains of an American Samoan soldier who died in the war and then returned to the US when the plane left Pago Pago. He concluded by extending sincere condolences to the grieving family on behalf of the governor, the government and the people of American Samoa. The audience also heard from Sen.
Tilo Vasaga, who shared memories, including their childhood with Faleomavaega, as the pair were among the first migration of American Samoans in the early 1950s heading to Hawai’i and the U.S mainland. Tilo shared that it was on July 11, 1952 when he and Faleomavaega left American Samoa on board the naval vessel Andrew Jackson, and both were around 9 years old and “can you image the thrill we had on that boat... two young Samoans?” “1952 was a great year... biggest migration of Samoans to Hawai’i” and other US states, he said, adding that both grew up in Laie, which was a “staging area for me and Eni” and it was a church community. “We could never get into trouble because of the way the community was set up” by the LDS church, where there were many community service projects and It was a must to participate in them, Tilo said. “It took a lot of our time.” These are some of the areas that shaped Eni to become a leader, he said. Other projects the pair were involved with was the establishment of the now popular tourist attraction, Polynesian Cultural Center, as well as construction of the Brigham Young University - Laie campus, where the pair was involved in work such as painting. 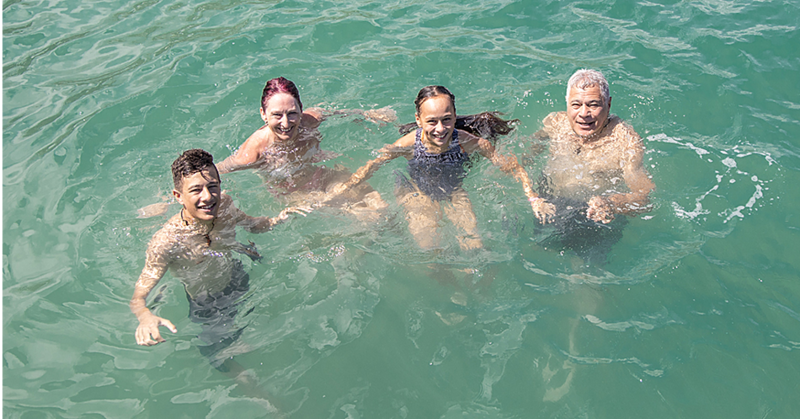 “We did all of this while we’re young, growing up in Laie,” he said. The pair also attended Kahuku High School, where Faleomavaega was the first Samoan to run for president of the senior class, but “he lost because Samoans were out numbered by Filipinos” and other ethnic students, said Tilo, who noted that Faleomavaega was recognized by the students for doing something different. Another community project cited by Tilo that he and Faleomavaega were involved with was “cleaning the chicken farm” that Faleomavaega didn’t like to do. And there was the taro patch project, where Faleomavaega showed his talent of planting and growing taro. Faleomavaega “loved his Samoan food,” including palusami and ‘cooked pua’a (pig), which is the late Congressman’s favorite. Tilo also spoke of the time in college with Faleomavaega, who would spend a lot of his time talking with professors and Tilo said he tagged along. “Eni was so determined that he spent a lot of time with the professors” who also wanted to talk to him, said Tilo, who noted that both he and Faleomavaega served in the Vietnam war but during different tours, but “we later met up several times” after Vietnam. “These are some of the many things that helped develope Eni [into] what he became. He became a very strong individual and he was a character,” Tilo said. “I knew from the beginning that I was hanging around with a person that had a lot of leadership traits.” Faleomavaega’s “leadership trait all started when we were growing up in Laie,” he added.